Where Do Ophthalmic Nurses Work? What Is an Ophthalmic Nurse? An ophthalmic nurse specializes in the ophthalmology branch of medicine, which focuses on the health of the eyes. An ophthalmic nurses assists in the assessment, treatment and care for patients with a variety of eye diseases or injuries, including glaucoma, blindness, astigmatism, cataracts, macular degeneration, nearsightedness, farsightedness, scratched corneas and eye trauma. Ophthalmic nurses work directly with ophthalmologists to treat patients of all ages, although eye diseases most often affect the elderly. Aspiring ophthalmic nurses must first complete their Associate's Degree in Nursing or Bachelor of Science in Nursing degree and pass the NCLEX-RN exam. During the course of their nursing education, it is most helpful to take elective courses in the anatomy, physiology and diseases of the eye. Once a nurse has earned his or her RN license, they may then begin work as an ophthalmic nurse. Nurses specializing in ophthalmology may also consider earning their Certification for Registered Nurses of Ophthalmology through the National Certification Board for Ophthalmic Registered Nurses once they have worked for at least 4,000 hours or two years as a nurse in an ophthalmology setting. To search and apply for current ophthalmic nurse positions, visit our job boards. What Are the Education Requirements for Ophthalmic Nurse? A position as an ophthalmic nurse requires an ADN or BSN degree in addition to an active RN license. Coursework in the anatomy, physiology and diseases of the eye are particularly critical for nurses interested in ophthalmology. After working as a registered nurse in an ophthalmic setting for two years, a nurse can sit for the Ophthalmic Nurse Certification exam offered by the National Certification Board for Ophthalmic Registered Nurses in order to become a Certified Registered Nurse in Ophthalmology (CRNO). While an RN can begin work as an ophthalmic nurse as soon as he or she completes their nursing degree and attains an RN license, the Ophthalmic Nurse Certification offered by the National Certification Board for Ophthalmic Registered Nurses is highly desired for career and salary advancement as an ophthalmic nurse. In order to sit for this exam, a nurse must complete 4,000 hours or two years of professional experience as an RN in an ophthalmic setting. Ophthalmic nurses assist in the assessment, diagnosis and treatment of patients with various eye diseases and injuries. They often assist with eye exams, record symptoms and perform vision tests. 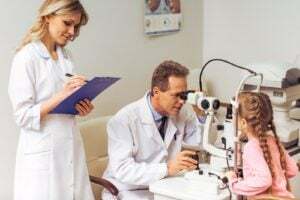 They also record patients' medical histories and perform physical examinations to uncover any underlying health issues causing symptoms in the eyes, such as diabetes. Ophthalmic nurses also play a critical role in patient education and treatment by administering medication such as eye drops and showing patients how to care for their eye injuries and diseases at home. The ophthalmic nurse also assists in contact lens and glasses fittings to improve a patient's vision. In cases in which eye surgery is required, ophthalmic nurses assist with surgical procedures and care for the patient before and after surgery. What Are the Roles and Duties of an Ophthalmic Nurse? The employment outlook for ophthalmic nurses is expected to increase as the general U.S. population ages, since diseases and conditions of the eye are more prevalent among the elderly population. The salary range for ophthalmic nurses varies depending on the geographic location, type of employer and years of experience. According to the Bureau of Labor Statistics, the median annual wage for registered nurses as a whole was $68,450 in May 2016.